I got an email yesterday letting me know BeamReader has now moved out of beta. 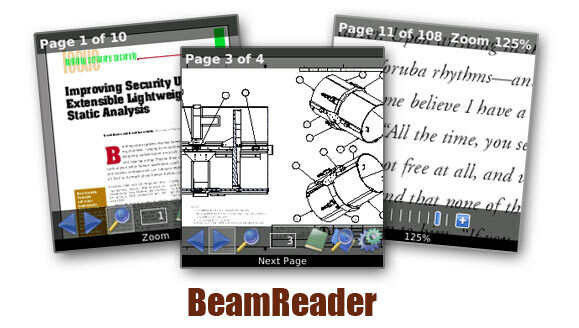 SLG Mobile (formerly BeamBerry Solutions), which recently was a part of the BlackBerry Cool 15 and got offers from the BlackBerry Partners Fund has released version 1.0 of their amazing PDF reader application. What sets this apart from other PDF applications is its great ability to render PDF files directly on the BlackBerry - no internet connection and no pre "formatting" of the files is required before you view them. This ensures a secure environment for your information and the included file browser is top notch and has the ability to launch other applications from within itself. No hassle. PDFs are displayed as they should be with all of their fonts showing correctly, rather then having them replaced by substitution fonts, which often times makes the PDF files look leaps and bounds away from their original format which is never a good thing, especially if appearences are vital in your files. Definitely an app worth checking out!